The sculpture titled Work was made in the contemporary era by the Decorative Art Studio, formerly the Łopieński Brothers company. The statue was created on the basis of a pattern of the Łopieński Brothers. It was a project designed in 1921 by Jerzy Leski (1906-1969), a Warsaw artist active in the field of sculpture, graphic art, graphic design and interior decoration. The Łopieński Brothers purchased the copyright from Leski, who was their collaborator, and adopted the design as the trademark of their company. Thenceforth, it adorned the company headed paper (the holdings of the Museum of Warsaw include such a document), and was published in the press of the period. Representations pertaining to work and sports were characteristic of the first three decades of the 20th century. They served to emphasize the value of work, physical strength, as well as manifest a healthy powerful body and the power of muscles. 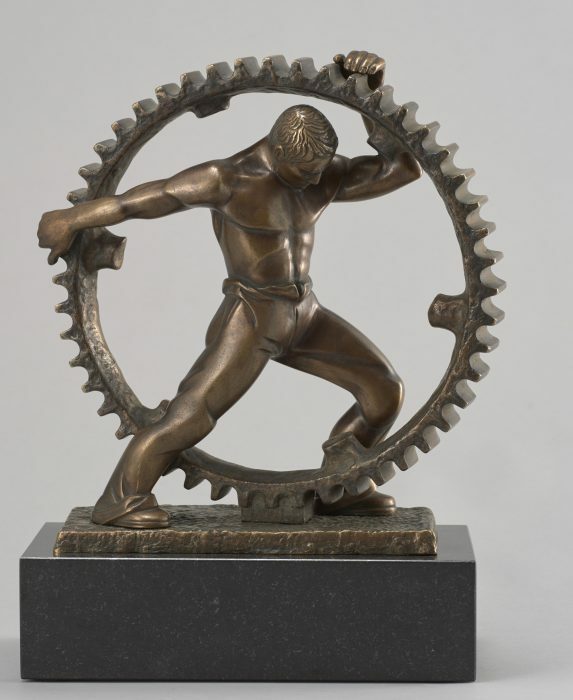 The Bronzeware Room features sculptures such as Blacksmith (1900–1925) from the the Łopieński Brothers studio, and Girl with a Jump Rope (1920–1939) created by Władysław Miecznik (1903–1989). The postwar period marked a return to the aforementioned themes and symbols. The Bronzeware Room also includes a statuette from the 1950s which bears the same title as the original; it was made by Władysław Miecznik. It is an example of a reproduction of a previously created well-known pattern, which was modified in a way that bears testimony to stylistic transformations and changing tastes of clients.